“To be inspired is great, to inspire is incredible.” There are inspiring people everywhere- you just need to look for them. Inspiration can come from your parents, friends, relatives, notable personalities or any other person you feel is doing well in their respective fields. In the technical world as well, some individuals let their work speak for them. Inspiration can be derived from anyone- be it old age inventors like Isaac Newton or modern-day masters like Steve Jobs and Mark Zuckerberg. The mastermind is the founder, CEO, and CTO of SpaceX; co-founder, CEO, and product architect of Tesla Inc.; co-chairman of OpenAI; founder and CEO of Neuralink. He has an estimated net-worth of $15.2 billion. Elon Musk is referred to as the guy who is always coming up with the most incredible solutions. From reusable rockets to solar roof tiles to self-driving technology, he is always creating something new. Pete Cashmore, founded Mashable at the meagre age of 19 and has been able to establish himself in the ever competitive digital world. Millions of users follow his content and in turn, find it useful. In fact, he was on the list of Time Magazine’s 100 most influential people in the year 2012. Besides this, he was also featured on Forbes 30 under 30 list. Dennis Crowley is the co-founder of Foursquare, one of the fastest growing companies in the last decade. With more than 20 million users, the application helps in finding places to go and tips on the good and bad places around. Besides this, Crowley also co-founded Dodgeball, a company which was acquired by Google in 2005. Amazon and its enormous success need no introduction and Bezos is the founder of the very enterprise. After realizing about the growing internet sector, the risk-taker left his New York City hedge fund job. Although the company was set up in his garage, it now has an estimated net worth of $430 million. We all know about LinkedIn, the largest social network for professionals around the world. But do you know the CEO of the multinational company? 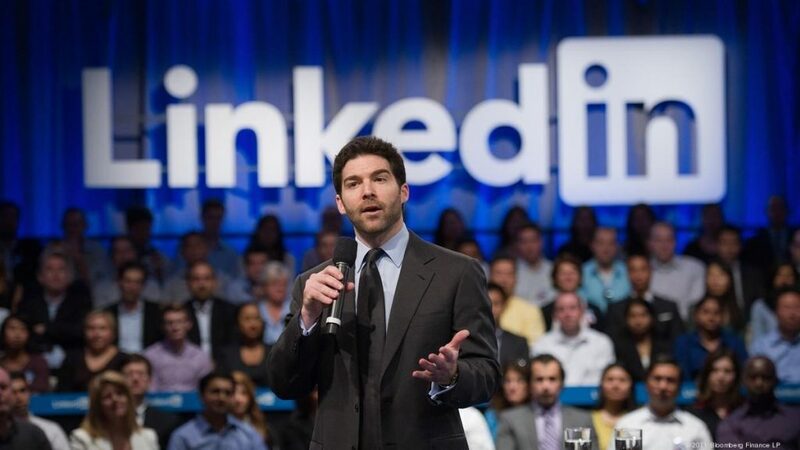 Jeff Weiner, the current chief executive officer of LinkedIn, has worked with brands like Yahoo and Venture Capital firms Accel Partners. The success of the company itself speaks large volumes about the capability of the man. Travis Kalanick, the man behind Uber, is an American computer programmer and businessman. His pet project Uber is ruling the on-demand car service sector with an estimated valuation of $50 billion. He is known for formulating another famous company Swoosh as well. Can it get any more inspiring? We all know about Google, but do you know the reason behind its existence? Larry Page it is. Page is the co-founders of the most influential website on the internet today. Larry’s net worth is estimated to be $20.3 billion which brings him on Forbes Richest Americans list. John Chambers joined Cisco in 1991 and is the Chairman and CEO of one of the largest network providers in the world since 1995. After his great leap as the CEO, the company’s revenue has grown from $1.2 billion to $40 billion. Who would not feel enticed by this one? Steve Blank has founded or worked with eight startup companies, four of which have gone public. Some of his very prominent ventures include Zilog, Convergent Technologies, Pixar and Rocket Science Games. Steve is known for developing Customer Development methodology and is an associate professor of entrepreneurship at Stanford. The Chairwoman and CEO of IBM, Virginia Rometty is the first woman ever to lead the company. After joining the company in 1991, Virginia rocketed her way to the top. Serving the committee of Columbia Business School and Northwestern University, she is an inspiration for women around the world. As the CEO and co-founder of Netflix, Hastings’ contribution has been pivotal in the company’s success. In fact, with more than 60 million subscribers worldwide, the company is posing as a threat to TV channels like HBO. With an estimated net worth of $2 million, Hastings already has an expansion plan in mind. Marc is the Chairman and CEO of SalesForce.com. The inspiring leader founded his first company to write Atari video games at the little age of 15. Marc started his pet project Salesforce.com in the year 1999 after stints at Apple and Oracle. Benioff is now a part of Cisco’s board of directors. Khosla is one of the co-founders of the famous technology company Sun Microsystems. He later formed his firm by the name of Khosla Ventures, which invested in various information technology engineering sectors. Quite recently, his firm has backed a new technology company called, TerraPower. He has also funded a company making ultra-low-cost-fuel and one developing combustion engines. One man and numerous ventures! We all know the technology industry is tough and competitive, yet these people had it in them to overcome all of it and accomplish all that they have today. Trust me, it is not easy at all! Take a cue from these people and who knows, you might be on this list one day. Editor Bio – Ms Sahiba Sadana is a professional content editor and an avid book-reader. She is a regular contributor to Sharda University, Business Town, and, Munfarid Consulting. The editor is well-known for her Content Marketing skills and has dealt with more than 150 clients.